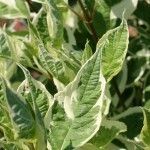 A compact shrub with creamy white variegated foliage. The leaves turn wine-red with white edging in the fall. The stems are deep red in the winter. 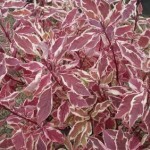 It is finer textured and more compact than Cornus a. 'Elegantissima'. It grows in full sun to part shade in average, well-drained soils. Prune as needed to encourage new growth.